Coziness at Sterling Ridge is the epitome of Hygge - a danish term. Sterling Ridge is the epitome of coziness, or what the Danish would call “Hygge” (pronounced hue-guh). Hygge has become increasingly popular with the new book The Little Book of Hygge: Danish Secrets to Happy Living. Sterling Ridge Resort has similar properties! Hygge is an untranslatable Danish word that can be summed up in several English equivalents: coziness, comfort, warmth, and togetherness. It is often said that hygge is a feeling, and not just a noun. If you’re not feeling hygge, you can’t truly experience it. When you feel the warmth of a fire from the wood burning stove, wrapped around a cuddly blanket with your loved one, wearing fluffy socks and comfortable clothes – you feel completely surrounded by love, warmth, and coziness. This is the meaning of hygge, and also the meaning of Sterling Ridge Resort, especially in these final winter months. We at Sterling Ridge Resort have spent 25 years improving and creating the optimal coziness for our guests. We have many returning guests who say that this is their getaway, to disconnect from the world and just spend time with the people they love. Hygge is the best case of cabin fever! It is a perfect chance to move a little slower, savor your coffee, and watch the snowfall. There is no need to rush off to work, but rather time to enjoy the small things that we may take for granted in our normal, busy lives. Whether at Sterling Ridge for vacation or home for a staycation, it is easy to implement hygge in your daily life. Think about what brings you the most coziness, warmth, and connectedness with your loved ones. It can be a simple hot cup of cocoa, family board game night, or a relaxing movie night alone. Whatever you choose, hygge is with you! 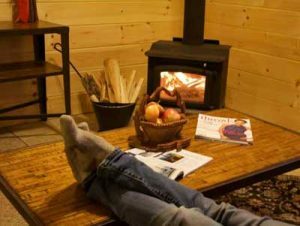 And although you can’t buy a hygge house, you can certainly rent a hygge-friendly cabin at Sterling Ridge. We look forward to seeing you!